Well Go USA recently send us over two Blu-Rays of their latest release "IP Man 3" to giveaway to two lucky people. The film stars Donnie Yen (Crouching Tiger, Hidden Dragon 2) and former boxing champion Mike Tyson. Want to win a copy. You can send an email to facontest@gmail.com. 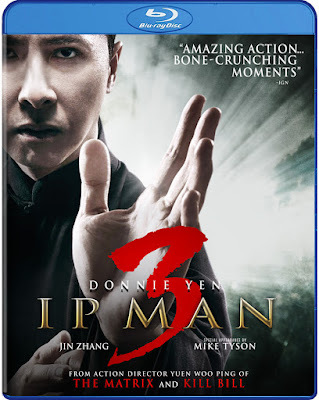 Please include "IP Man 3" in the subject line. Contest ends on April 24th. Donnie Yen (Crouching Tiger, Hidden Dragon 2) ignites the screen in a return to the role that made him an icon - as Ip Man, the real-life Wing Chun grandmaster who mentored Bruce Lee. In this explosive third installment of the blockbuster martial arts series, when a band of brutal gangsters led by a crooked property developer (Mike Tyson) make a play to take over the city, Master Ip is forced to take a stand. Fists will fly as some of the most incredible fight scenes ever filmed play out on the big screen in this soon-to-be genre classic.